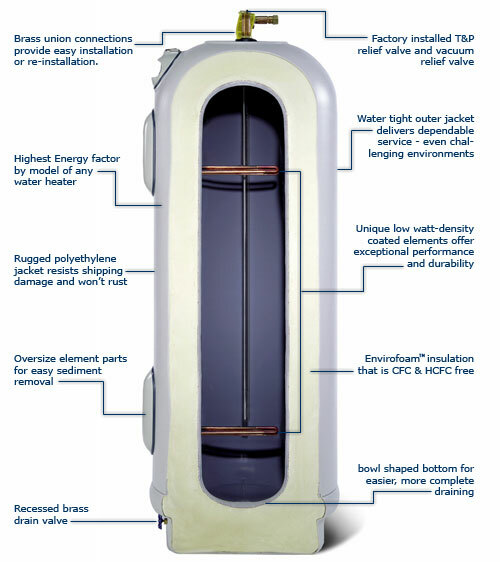 Marathon: The Last Water Heater You’ll Ever Buy! These water heaters offer a 10-year standard leak warranty that can be upgraded to a lifetime leak warranty simply by registering your water heater. With a warranty like that, you can stop worrying about your water heater. Not only will the Marathon save headaches and money since it eliminates leaks and water damage, it also takes a bite out of your energy bill. Its super thick Envirofoam Insulation® keeps heat in the tank better than any water heater on the market. The Marathon is a revolution in water heater technology. So forget everything you’ve learned about antiquated steel tank models. Because the Marathon’s tank is seamless polybutylene reinforced with filament wound fiberglass, it’s guaranteed not to leak as long as you own your home. Even the outside is made of tough polyethylene, so there’s nothing to rust or corrode, inside or out. Although it costs a little more, your Marathon pays big dividends since you won’t be spending money on repairing leaky water heaters, replacing damaged floors or buying wasted energy. And that’s forever. Never worry about leaks again. Your Marathon is warranted not to leak for as long as you own your home, you just need to register it. The most efficient. The Marathon is the most efficient size for size of any water heater available. Kind to the environment. Because the Marathon is super-insulated with Envirofoam Insulation®, no CFCs or HCFCs are used in the manufacturing process. Water resistant tank shell. Neoprene gaskets keep moisture from penetrating the tank shell and the outer jacket will never rust like steel tanks. Great for harsh commercial and agricultural environments. No rotten egg odor. No anode rod means you don’t have to worry about any rotten egg odors that plague other units. Visit the Rheem Marathon web site for additional information. View our pricing information (PDF). To purchase a Marathon water heater from Plumas-Sierra REC just give us a call.